So far I have been doing pretty well with my resolution of eating better and exercising regularly. Last week I only managed to make it to the gym 3 days instead of 5. Some days it's hard for me to squeeze it in. The best time for me to go is in the morning. The problem with that is that all of my moms meetups and Gymboree classes are in the morning. This usually only leaves about two days during the week open that I am able to go in the morning. I can always go in the afternoon, which I often do. The glitch in that plan is that sometimes Aubs naps a long time and I hate going to the gym after 4 because it seems like I have to rush home to make dinner. I'm trying to get better at scheduling a crock pot meal for the days that I am busy in the morning so that I don't have any excuses not to hit the gym. Another thing that I have been making sure to do is eat a healthy breakfast. Sometimes I'm not that hungry in the morning but I make myself eat something anyway. If I skip breakfast I usually end up starving by lunch and making poor choices on what to eat. Or I'll start picking at things and adding unneeded calories to my diet. I thought that today I would share one of the meals that I have been eating for breakfast for the past couple of weeks. 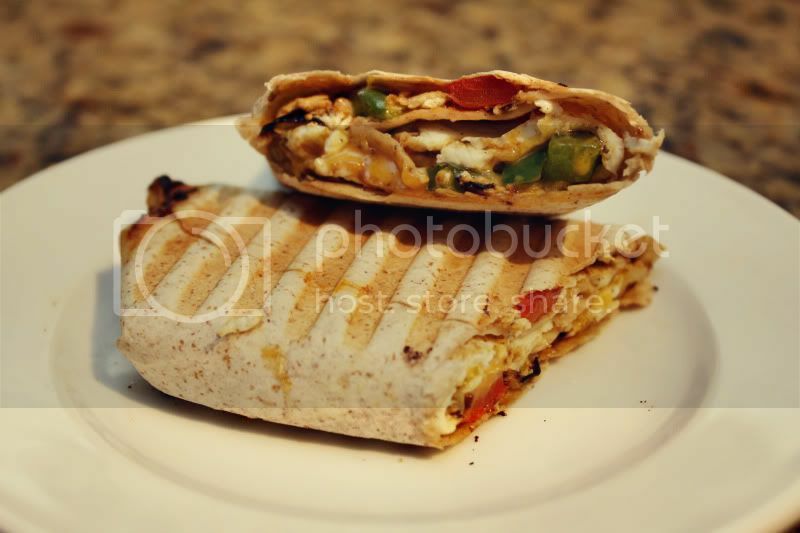 I probably eat this breakfast wrap 3 or 4 times a week. Heat a skillet over medium heat and spray with Pam. Add garlic, onions & pepper and saute for about 5 minutes. While these are cooking separate your eggs (unless you are using liquid whites) and add black pepper. Once the onions are translucent and the peppers are softened add your egg to the skillet. Since the skillet is hot the egg will cook in about a minute to a minute and a half. 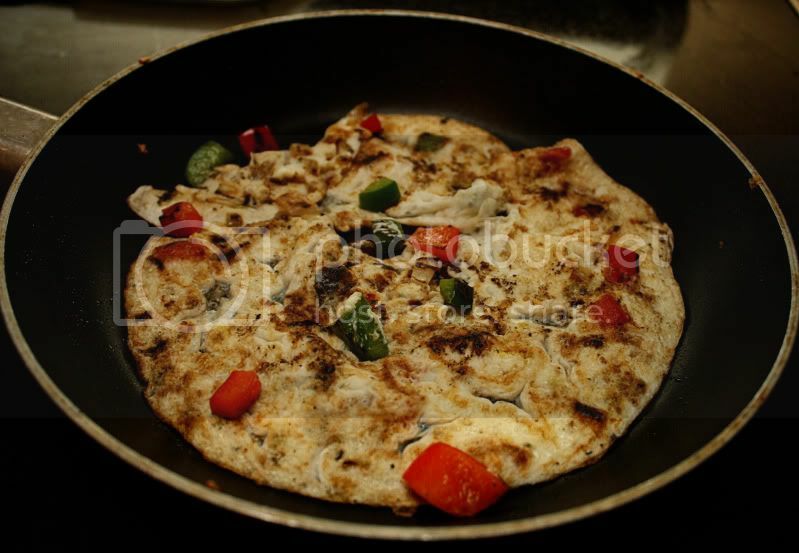 Once the egg is cooked through remove skillet from the heat. Next take your wrap and place it in between two paper towels and cook in the microwave on high heat for 20 seconds. 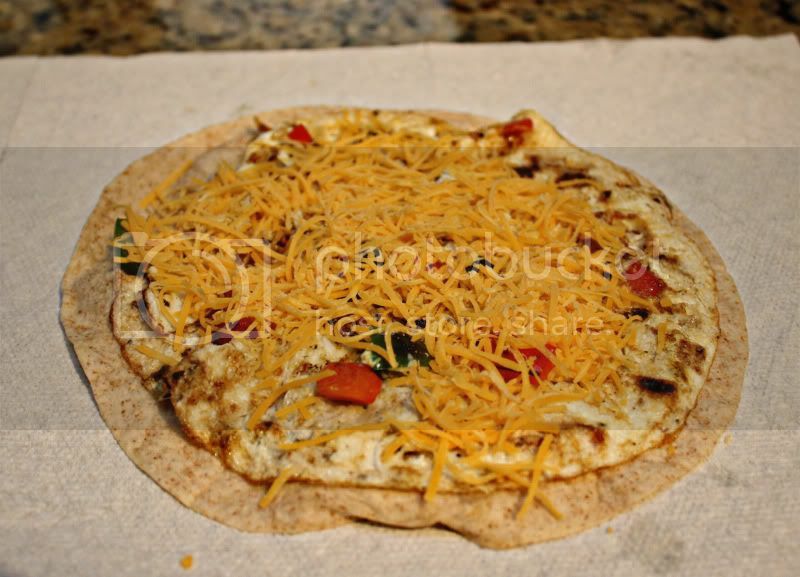 Remove from microwave and slide your eggs off of the skillet and on to the wrap. Then sprinkle your cheese on top. Now roll up your wrap by folding in the ends and rolling tightly. 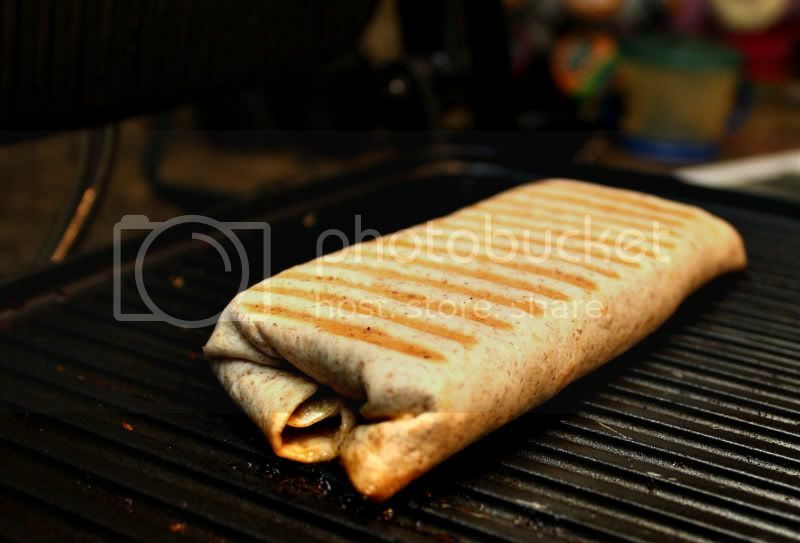 Place rolled wrap seam down on heated panini press. Press wrap for about 2 minutes or until toasted. Slice on a angle and enjoy! I also have a winner for the Dondalee ring giveway. Yum! I'll need two things to make this. A panini press....and a microwave!!! Can you believe we don't have a microwave??? Yummo!!! Please dont say you 'Only' made it to the gym 3 times, cause that's still 3 times that you made it, and that's 3 x more than not going at all!! Your doing amazing!! Tag, you're it! Stop by my blog to read the post and pick up your questions. Great idea, love the step by step pictures, and looks yummy! Love the step by step pictures. It looks yummy and easy to make. Yum, that looks great. And perfect step by step pictures. Yum, and looks easy to make, especially with your step by step pictures. I'll be making this for breakfast! !